Nigerian Afro-pop singer and lover boy, Davido is quite elated after his ‘babe’, Chioma who has for the past few days been on media headlines, bagged an endorsement deal. It’s no doubt that the chef achieved this feat because of the publicity generated from the way her beau treats her and more notably, his lavish birthday gift to her few days ago. 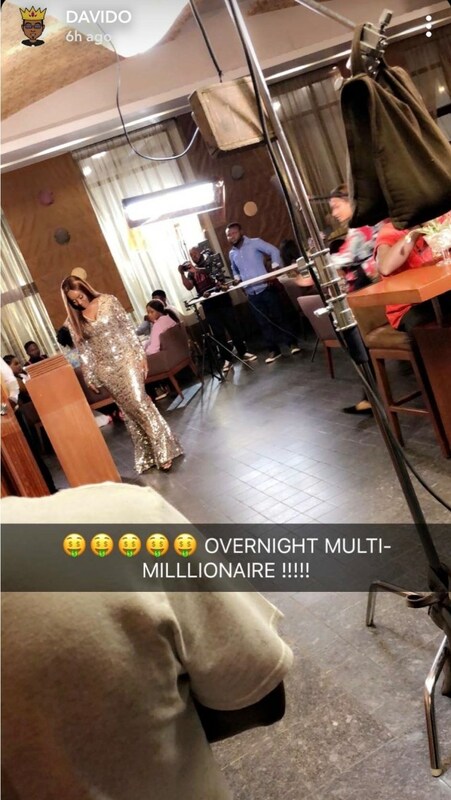 The singer had shared few days ago after gifting her a Porsche car that some company wanted to endorse her with N60 million which he refused, telling them to raise the money to N100 million because she’s worth more than that. Davido made this known via his Twitter handle on Tuesday, May 1, 2018, where he tweeted about it. “Just got an endorsement offer for my baby 60 m I told them bring 100m then she might think about it,” he tweeted. Well, recently it appears the singer has agreed for her to sign onto a brand in Abuja. After partying at a night club shortly after the singer bagged 5 awards at the Headies 2018, Davido jetted out to Abuja with Chioma. He accompanied her to the brand’s photo-shoot in Abuja and shared the BTS photo.